The University of Hawai‘i Maui College EdVenture program and the Sustainable Living Institute of Maui will offer a beekeeping series Friday through Sunday, Aug. 7 t0 9. Danielle Downey and Noelani Waters, apiculture specialists for the state Department of Agriculture, will teach the first two classes on the UHMC campus from 9 a.m. to 3 p.m.
On Aug. 7, “Intermediate Beekeeping” will offer hands-on work with the hives, focusing on bee health issues, identifying and managing bee diseases and parasites, while keeping hives healthy for greater honey production. 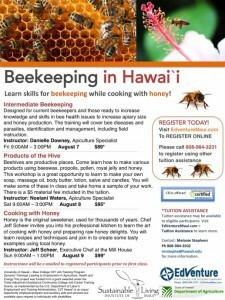 Hives for these trainings are located in the established apiary in the Maui Master Gardener garden, generously donated by the state DOA and UH Mānoa Honeybee Project. The cost of the workshop is $89. On Aug. 8, “Products of the Hive” will provide instruction in the creation of lotions, lip balms, soap, massage oil and candles, some of which will be made in class. The $95 fee includes materials. On Aug. 9, from 9 a.m. to 1 p.m., Executive Chef Jeff Scheer of the Mill House at Maui Tropical Plantation will invite participants into his kitchen for “Cooking With Honey.” Students will have the opportunity to learn delicious ways to use honey in both cooked and raw dishes. The $99 fee includes materials. “Chef Scheer has a reputation for making his kitchen a fun place to be,” said SLIM Education Specialist Melanie Stephens. The classes are limited to 15 participants each; register early online  or by calling EdVenture at 984-3231. For more information, email  Stephens.